The airplex modularity system is a fully modular radiator system for water cooling systems and shows competence and know-how of the 10 years of company history at Aqua Computer. The system is based on a fin package with 21 copper tubes and pressed-on stainless steel flanges. On both sides of the fin package Delrin terminals are integrated. These terminals create a safe seal with the stainless steel flanges with a gasket ring and are screwed together. The Delrin terminals have integrated connection terminals which are lowered from the surface and have a round spacing above the thread. This spacing allows a connection adaptor to be pushed in two connect two radiator modules directly without any tubing pieces. The orientation of the radiator to each other determines the flow direction of the coolant: When connected side by side the connected radiators are connected serially, horizontally stacked radiators create a parallel flow set-up. Additionally the system can also grow in length indefinitely. For this the fin packages are connected via optional Delrin connection modules. Radiators in all lengths use the same Delrin Terminals, only the side panels and fin packages are different, hence by buying the components, a radiator can be rebuilt and modified. All sizes have a width of 146mm and hence fit perfetly into 5.25". The height of the radiator in standard configuration (without the pump module) is 63.5mm and the length is 44mm longer than the according fan (e.g. 3x120mm fans -> Length is 360+44mm = 404mm). The connection threads are G1/4" in size and all 1/4" fittings from our shop can be used with the system. With the airplex modularity system. 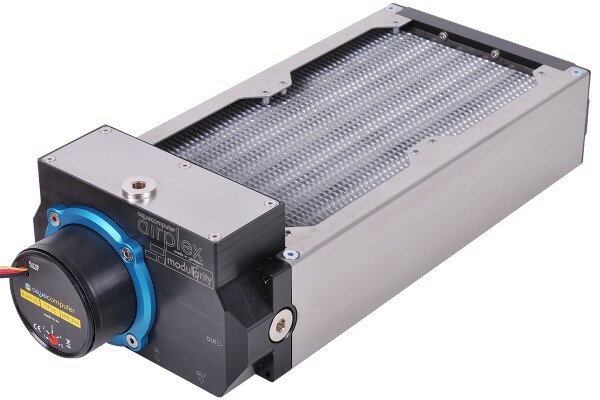 It is now possible for the first time to operate two separate loops in one radiator with the airplex modularity system. On radiators operated this way the cooling surface is split approximately at a 70:30 ratio between the primary respective secondary loop. This allows extremely compact two-loop cooling systems, to allow e.g. separate cooling of the heat-sensitive HDDs from the CPU and graphics card. The two cooling loops are completely separated from each other, mixing of the coolant is completely impossible. By equipping the system with an optional pump module an extremely compact and easy to handle water cooling system can be realized. The offered radiators with pump module have the reservoir and pump already integrated directly into the Delrin terminal of the radiator. Depending on the type it even features an USB fan controller with water temperature measuring and optionally flow meter and/ or water filter. An especially interesting feature is the Compact 600 pump module in the 12V version: It is equipped with the proven ceramic bearing from Aqua computer and allows whisper-quiet operation as well as many monitoring and control options via the integrated pump controller with USB interface. Mounting of a flow sensor and filter is easily possible and can be done quickly and hassle-free.